It's cucumber season again, and if like us you have so many that you don't know what to do with them, then this recipe is for you! Cold pickling is quick and easy, and uses salt to draw out the excess moisture. This recipe, from guest chef Kevin Hague, works best with small gherkin cucumbers, but you can use any type provided that they are not too big. Remove any stalks and dried flowers from the ends. Wash the cucumber skins and rub with a cloth to remove the fine fibres on the skin. 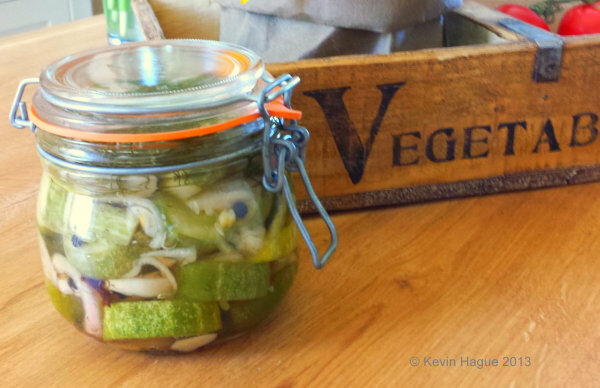 If the length of your cucumbers will fit into your jars whole then just cut them into quarters lengthways. Otherwise cut them onto 5mm slices. Next put a layer of salt in a bowl, add a layer of cucumbers, and then another layer of salt, and repeat until all the cucumber is used up. Finish with a layer of salt, cover the bowl and leave at room temperature for 24 hours. Wash the cucumbers to remove the salt and pack into clean sterilised jars, adding shallots, garlic, herbs and spices as you do this. Leave about 1cm of space at the top. Now fill the jars with vinegar to completely cover the cucumbers. Seal the jars with vinegar-proof lids, and leave to mature for 3-4 weeks in a cool dark place.